The WITTMANN Group is pressing home its technical advantage this month with the launch of yet further new models in the company’s linear robot range. The revamped W831 linear robot is now available worldwide, and offers plastics processors the opportunity to automate the production of even heavier payloads on middle-size molding machines. The new and reinforced W831 robot model can be equipped with vertical strokes ranging from 1,000 mm, 1,200 mm to 1,400 mm. And where up to 1,200 mm of vertical stroke is supplied the maximum payload has increased to 12 kg. The horizontal stroke starts with 2,000 mm for standard configurations and can be extended up to 5,000 mm. The possibility of lengthening the Z-axis up to 5,000 mm is for example enabling a mounting in so-called L-configuration and this, in turn, is offering the possibility of clamp-end placement of the parts. 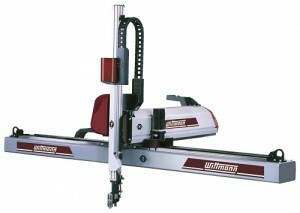 Furthermore, the robot can also be mounted in T-configuration, working the space on both sides of the molding machine. A total of three highly dynamic servo drives for the main axes are supplied as standard with the W831. The device can be equipped with additional rotational servo drives for further degrees of freedom in movement, when becoming necessary for more complex post-processing steps. If additional digital or analog inlets or outlets are needed for the control of extra components, the W831 can be equipped with additional flexible I/O modules. For this, the R8.2 robot control is providing an integrated real-time network – thus the I/O modules can be easily and optimally placed. In keeping with all the other WITTMANN W8 series standard robots, the W831 also features the integrated control cabinet for space saving next to the molding machine and a moveable kick-stroke design for unlimited space in front of the vertical arm, as well as best balance for the long time of linear rails and bearings. Typically W831 robots are mounted on molding machines in the range of 500 tons of clamping force.